Abstract: Objective To explore the relationship between exon mutations of NOTCH3 gene and clinical phenotype in patients with cerebral autosomal dominant arteriopathy with subcortical infarcts and leukoencephalopathy (CADASIL). Methods We consecutively included 30 CADASIL patients with clinical symptoms in 15 pedigrees, who visited Shanghai Ninth People's Hospital, Shanghai Jiao Tong University School of Medicine from May 2015 to Dec. 2017, and collected the clinical data and genetic analysis results. Furthermore, we analyzed the relationship between the exon mutations of NOTCH3 gene and clinical phenotypes, including age at onset, first clinical symptoms and frequency of symptomatic ischemic stroke. Results Twelve mutation sites of NOTCH3 gene were detected in the 15 pedigrees. Seven of them were located in exon 4, 3 in exon 11, 1 in exon 19, and 1 in exon 20. The onset age of the patients carrying exon 11 mutations was the latest ([53.6±13.3] years, n=7), followed by the patients carrying exon 4 mutations ([42.7±5.7] years, n=15). The onset age of 8 patients with mutations in other exons (exon 19 and 20) was (33.5±7.5) years, which was significantly earlier compared with the patients with exon 4 and 11 mutation (P < 0.01 and P < 0.05). Most of the patients with mutations of exon 4 had motor and speech disorders (11/15, 73.3%), while ones with mutations of exon 19 and 20 had cognitive impairment (7/8, 87.5%). Most of the patients (11/15, 73.3%) carrying mutations in exon 4 had motor and speech disorders at onset, while 7 of 8 patients (87.5%) with mutations in exon 19 and exon 20 had impaired cognition at onset. The times of symptomatic ischemic stroke in patients with mutations in exon 4 was 3 (median) and in patients with mutations in exon 11 was 2 (median), and no symptomatic ischemic stroke occurred in the patients with mutations in exon 19 and 20. Conclusion Exon 4 and exon 11 of NOTCH3 gene are hotspots of mutations in the cohort of CADASIL cases, and the mutations in different exons are associated with onset age, first symptoms and symptomatic ischemic stroke. MATSUSHIMA T, CONEDERA S, TANAKA R, LI Y, YOSHINO H, FUNAYAMA M, et al. Genotypephenotype correlations of cysteine replacement in CADASIL[J/OL]. Neurobiol Aging, 2017, 50: 169.e7-169.e14. doi: 10.1016/j.neurobiolaging.2016.10.026. LIU X, ZUO Y, SUN W, ZHANG W, LV H, HUANG Y, et al. The genetic spectrum and the evaluation of CADASIL screening scale in Chinese patients with NOTCH3 mutations[J]. J Neurol Sci, 2015, 354(1/2): 63-69. LIAO Y C, HSIAO C T, FUH J L, CHERN C M, LEE W J, GUO Y C, et al. Characterization of CADASIL among the Han Chinese in Taiwan: distinct genotypic and phenotypic profiles[J/OL]. PLoS One, 2015, 10: e0136501. doi: 10.1371/journal.pone.0136501. HE D, CHEN D, LI X, HU Z, YU Z, WANG W, et al. The comparisons of phenotype and genotype between CADASIL and CADASIL-like patients and populationspecific evaluation of CADASIL scale in China[J/OL]. J Headache Pain, 2016, 17: 55. doi: 10.1186/s10194-016-0646-5. RUTTEN J W, DAUWERSE H G, PETERS D J, GOLDFARB A, VENSELAAR H, HAFFNER C, et al. Therapeutic NOTCH3 cysteine correction in CADASIL using exon skipping:in vitro proof of concept[J]. Brain, 2016, 139(Pt 4): 1123-1135. MONET-LEPRÊTRE M, BARDOT B, LEMAIRE B, DOMENGA V, GODIN O, DICHGANS M, et al. Distinct phenotypic and functional features of CADASIL mutations in the Notch3 ligand binding domain[J]. Brain, 2009, 132(Pt 6): 1601-1612. GE W, KUANG H, WEI B, BO L, XU Z, XU X, et al. A novel cysteine-sparing NOTCH3 mutation in a Chinese family with CADASIL[J/OL]. PLoS One, 2014, 9: e104533. doi: 10.1371/journal.pone.0104533. BERSANO A, RANIERI M, CIAMMOLA A, CINNANTE C, LANFRANCONI S, DOTTI M T, et al. 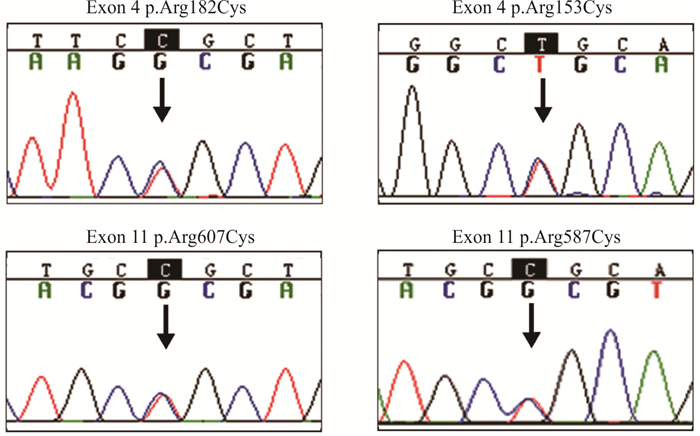 Considerations on a mutation in the NOTCH3 gene sparing a cysteine residue:a rare polymorphism rather than a CADASIL variant[J]. Funct Neurol, 2012, 27: 247-252.